Olentangy Orange senior Lauren Perrone (right) looks for an open teammate as coach Bob Scott looks on during a practice earlier this month. 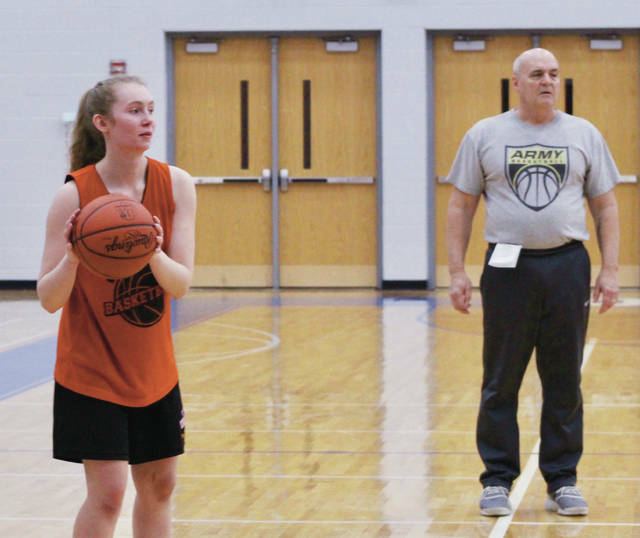 According to fifth-year coach Bob Scott, the most improved aspect of the Olentangy Orange girls basketball team is its camaraderie. The Pioneers feature just five players who saw varsity action last year. So, if they’re going to be successful – it’s going to have to happen as a unit. Scott has struggled to get wins in his first four years at Orange, going 30-62. He went 166-122 in 13 seasons at Big Walnut, including a 141-64 mark over his final nine seasons while reaching the district semifinal round in eight of those years. Orange has three seniors on a roster of 10 – Lauren Perrone, Maddie Erickson and Madi Felchlin. Perrone believes the team has worked hard to come together in the offseason whether it’s cheering each other on during a water break or other forms of motivation. Erickson will make the move to point guard after playing off the ball in the past. Juniors Anna Grabau and Riley Duffy are key returnees from last year’s squad. Grabau is the team’s top returning scorer (6.7 points per game). Juniors Madi Riley, Joy Gimei and Camille Barron and sophomores Reece Miller and Brooke Thompson are newcomers to the varsity level. The goals aren’t lofty for Perrone and the Pioneers. She wants to start with snapping the team’s 12-game OCC-Buckeye losing streak.